Luxury 4 bed / 4 bath villa with 2 master suites, 1 ensuite bedroom & 1 Jack & Jill ensuite bedroom, ideal for 2 families sharing with conservation views from the large private pool. The attractively furnished villa also includes large LCD cable TV in family room & LCD cable TV's in all the bedrooms. 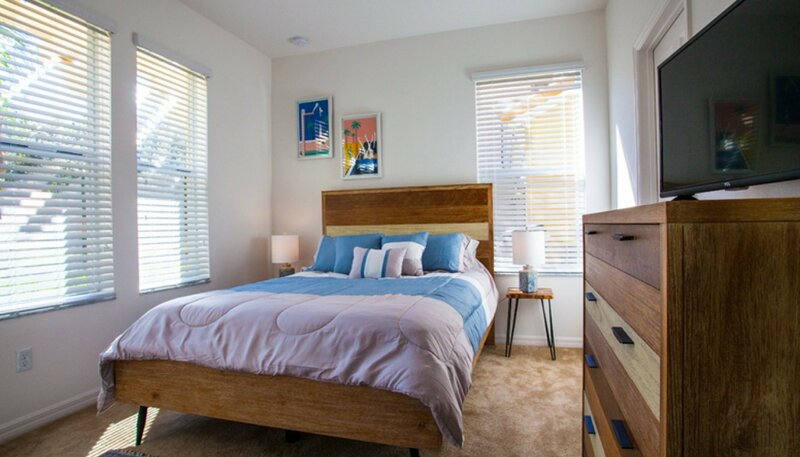 In addition, there is a monitored alarm system, high-speed DSL internet access and baby equipment & gas BBQ rental. Fully equipped kitchen with oven, microwave, dishwasher - nothing left out !! High-speed wireless DSL Internet Access - use your smartphone / laptop anywhere !! As you enter the villa you are greeted with a fabulous tiled hallway leading off to queen bedroom #4 with adjacent Jack & Jill bathroom. The hallway then leads to the spacious living space with family room, dining area and kitchen beyond. The comfortably furnished living room with views to pool deck offers ample seating for you to relax and watch the large LCD cable TV. Adjacent to the family room with views and direct access via sliding doors onto the pool deck is the dining area with a round dining table with 4 chairs and is ideal for informal dining. 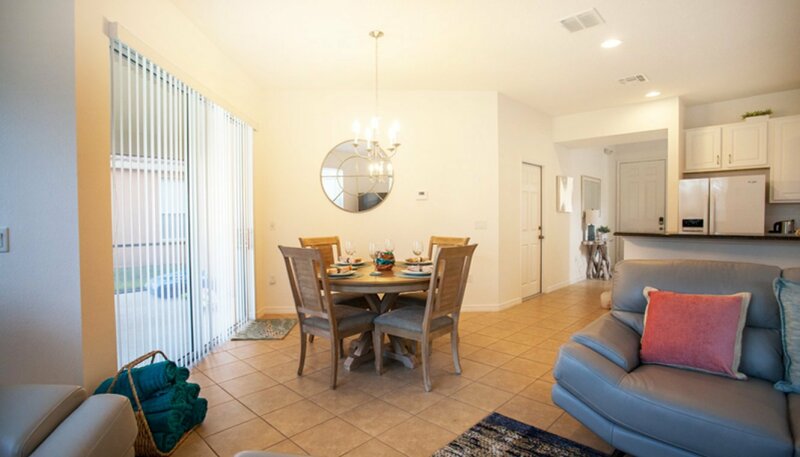 The luxury kitchen with quality appliances and granite countertops is adjacent to the living room and is fully equipped for all your culinary needs. There is a large cooker with oven and four top rings. There is a microwave, a dishwasher and a large fridge/freezer with water/ice dispenser. Everything you could possibly need has been provided including cutlery, crockery, glassware and poolware for 8 people. All cooking pots and pans are also provided. The breakfast bar island unit with 4 bar stools is a real hit for the kids at breakfast time. This bedroom is located to the front of the villa with views over the front landscaping and is equipped with a queen bed with matching nightstands, chest of drawers with LCD cable TV above and built-in wardrobe. The Jack 'n' Jill bathroom adjacent to bedroom 4 (shared with living space) provides a built-in washbasin, WC and bath with shower over. Laundry facilities are located in the garage providing a washing machine, tumble drier, ironing board and iron, washing your clothes while on holiday is made easy. The large extended pool deck with 30’ x 15’ pool enjoying wonderful conservation views with no rear neighbours ensures that sun worshippers are able to keep their tan topped up, as the sun is most of the deck from sunrise to sunset. With 4 sun-loungers, there are plenty of beds to go around. 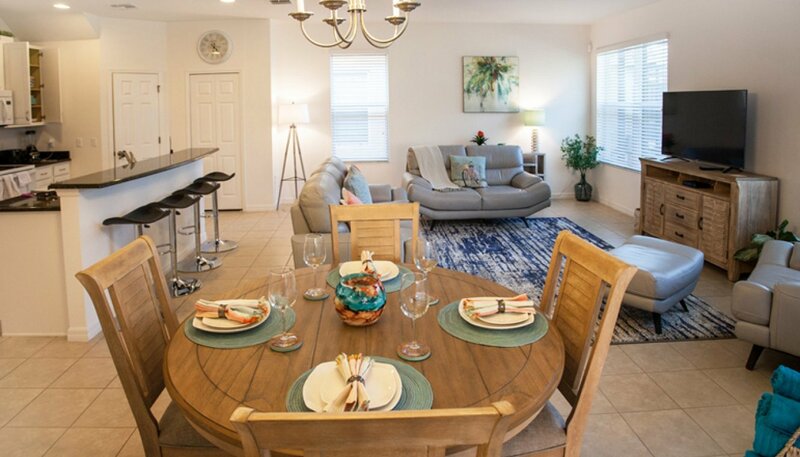 The shady lanai with patio table & 8 chairs offers welcome relief from the Florida sun for those of a more delicate disposition. Toddler pool safety fence ensures safety for the very young. This can be removed subject to you feeling confident about safety around the open pool. It's just an 8-minute walk to the excellent resort clubhouse and community pool. Master 1 bedroom is located upstairs and has been furnished to a high standard with king sized bed, sitting area, dual aspect views and wall mounted flat screen cable TV. 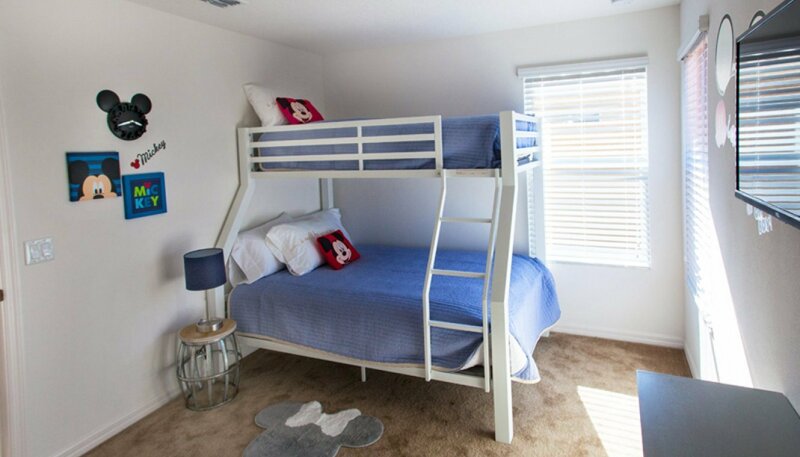 There is a large walk-in closet which has a hanging space and there is ample drawer-space for all your holiday clothes in the main bedroom area. The ensuite bathroom offers a large walk-in shower, single vanity and separate WC. The second master bedroom with its wonderful views over the front gardens has been furnished with a queen sized bed, matching nightstands, chest of drawers with LCD cable TV above & built-in wardrobe. The connecting spacious ensuite bathroom has a bath with shower over, built-in sink unit and WC. 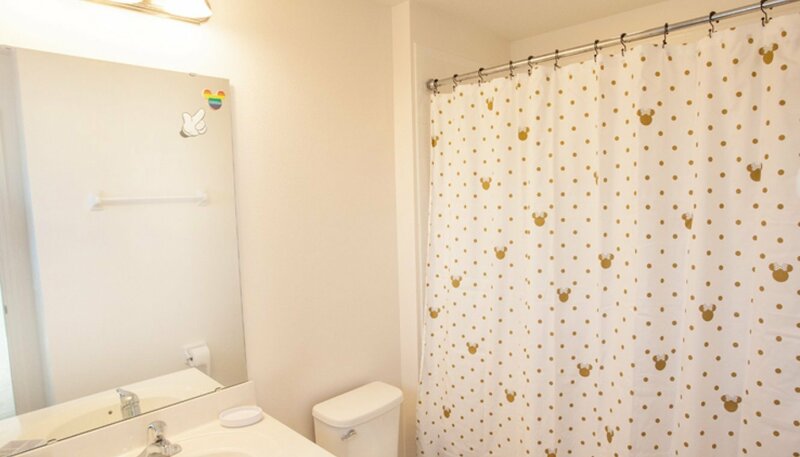 This Mickey & Minnie themed bedroom has bunk beds (twin over full-size), built-in wardrobe and a chest of drawers with wall mounted LCD cable TV above. The ensuite bathroom offers a built-in washbasin, toilet and bath with shower over.